William Latymer was the third son of William Latymer and his wife Anne and was born in Freston, Suffolk in approximately 1498. His early life is unknown but he first became noticed when he became one of Anne Boleyn’s chaplains and was a patron of the Reformation. In 1536 he graduated Corpus Christi College, Cambridge with an M.A after seven years of studying. Latymer was in Europe collecting books for the Queen when she was arrested and sent to the Tower of London Latymer was arrested at Sandwich upon his arrival back in England accused of bringing foreign books about the Protestant reformers into the country, Latymer handed the books over to the authorities and with that was released. After the fall of Anne Boleyn Latymer was the rector of Witnesham, Suffolk between 1538 until 1554 and also in 1538 he was appointed by King Henry VIII to Master of the College of St Laurence, Pountney. In 1549 Latymer was involved in the trial of Edmund Bonner, a Catholic who in the reign of King Edward VI opposed the first Act of Uniformity and Book of Common Prayer and failed to enforce them in his church. As a punishment the Council required him to speak at St. Paul’s Cross regarding royal authority. Bonner spoke but made significant omissions and as a result he was called to stand trial in which Thomas Cranmer presided over and Latymer was the principal witness. In 1560 Latymer married Ellen English and when Queen Mary I took the throne as a married clergyman he was dismissed and retired to Ipswich. When Queen Elizabeth I took the throne Latymer became her chaplain and also wrote ‘The Cronickile of Anne Bulleyne’ he focused on Anne’s time as Queen and the speeches she gave regarding religion, education and charity. He is the only author to have written about Anne Boleyn that actually knew her. 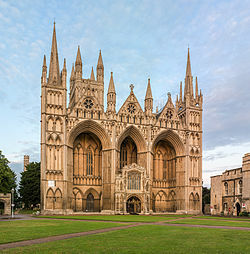 Latymer died on 28th August 1583 and was buried in Peterborough Catherdral.